An OPA! 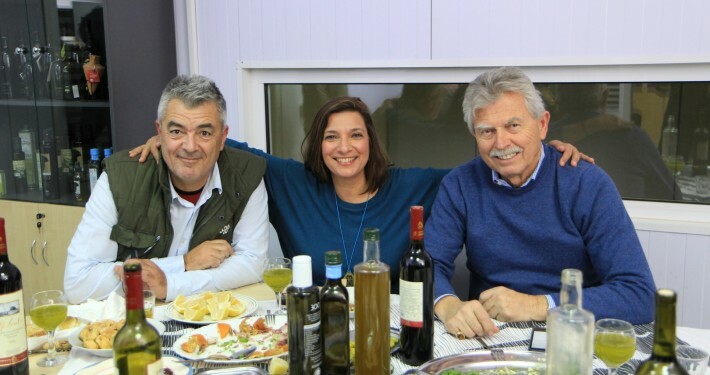 of a TV trip to Greek flavors, guided by Diana Kochila, airing on National Public Television. In a series of 13 episodes, a journey that will showcase landscapes and flavors of Greece like never before. The episodes will travel to Crete, the Peloponnese, Athens, Santorini, Ikaria, Lesvos, Volos, Pelion, Ioannina, the Zagorohoria, and Naoussa, meeting some of Greece’s best home cooks and storied food and wine artisans. Diane Kochilas is going to “travel” the American audience to locations and tastes of Greece, highlighting the incomparable Greek hospitality. In Episode 104, Emerald green Greek extra virgin olive oil is the star of this show, as we watch it flow from tree to kitchen with a stop in between at the massage table. Diane takes us on a journey to the stunningly preserved town of Monemvasia in the Peloponnese. Greece’s liquid gold transforms a simple vegetable medley into a luscious dish and slips between the folds of billowy rice and greens in a succulent pilaf spiked with a squeeze of lemon juice. Olive oil gives dessert a distinct character too. It’s a primary ingredient in Halva, an earthy pudding-like creation spiked with dried fruits, orange zest and nuts. Explore the diversity and beauty of one of Greece’s most delectable exports. This entry was posted in blog and tagged diane kochilas, flying olive farms, Greece, greek, my greek table, olive oil, PBS, vrisi 36, vrisi36. Bookmark the permalink.